Today marks the fourth year of Generosity Day. I’ve heard from people as far away as Dubai and as close as a local preschool in New York City about their plans for Generosity Day this year. It makes me proud, and it humbles me. This year, my celebration of Generosity Day is a quiet one. I decided this year that I wanted to focus my energies on the practice of generosity, rather than on further spreading the word about Generosity Day. So the Generosity Day team is not doing a big online media push or reaching out to the press. This feels right this time around. Generosity Day has always been organic and has always lived in the hearts of those who choose to celebrate it. Evolution is part of what makes this a real, living and breathing thing. For all of you who are celebrating Generosity Day today, I encourage you to take a moment to remember that you are part of a global community that cares about the practice of generosity. This is a community that knows that we can choose to become the people we aspire to be, a community that understands that through practice we grow and evolve, a community that lives everywhere and is owned by no one. I wish you a day of discovery and of joy. I thank you for the gifts you give to others, the gifts you give to this community, and the gifts you give to yourself. This question is hard because it gets to the core of what we mean by “community.” In the next century, will our community remain those who are physically nearby? Meaning, despite all of our online connectivity, will we remain fundamentally and predominantly rooted in the places we send our kids to school, the common spaces we use, the places we shop, and the chance encounters we have that cause us to stop, pick our heads up from our smartphones and our calendars, and have a good 10 minute chat? Or will borderless communities of common (weird) interests become what define us? Will our identities, our values, what we care about, and ultimately our sense of community increasingly transcend location? And if you ran an organization like the Y, how would you have these two streams interact? Henry did something surprising and beautiful to start to answer this question. Of course the core work of the 92nd Street Y is the outstanding arts programming, teaching, preschool, sports and community events. But why couldn’t the Y, as a community organization, help build a virtual community of shared values, and give space to expression of those values in the real world? So Henry, along with a small group of troublemakers (most notably the UN Foundation), created #givingtuesday, a day devoted to generosity of all stripes. Giving Tuesday serves as the other bookend to Thanksgiving, so that we can start our long weekend with a day of giving thanks, run around like maniacs to shop for bargains on Black Friday and Cyber Monday, and then return to the roots of giving and generosity on Giving Tuesday. What a great idea. As Henry and I began discussing Giving Tuesday it became clear that a lot could be gained by bringing together the collective energies of the Generosity Day and Giving Tuesday movements. To kick that off, I’m excited to have the Generosity Day crew lend its collective energies to Giving Tuesday this year. We’re joining the likes of Melinda Gates, Bill Gates, Matthew Bishop, Adam Grant, the Case Foundation, the UN Foundation and more than 6,000 other nonprofits that are committed to making Giving Tuesday a huge success. If you’re excited to get involved in Giving Tuesday, the best thing you can do is to make today a day of giving and to spread the word to others. And, if you’re game, join the likes of Sec of State John Kerry by taking an “unselfie” and posting it to your Twitter/Facebook/Instagram/tumblr/etc. feed. Here’s mine. To take it further still, become a Giving Tuesday social media ambassador and help spread the word! I’m a very visual person, but I’ve never learned how do to any proper design, so I’ve always been a bit bummed that we’ve not been able to visually represent the beauty and spirit of Generosity Day…until now. I mentioned yesterday that the folks at Masterminds had done some incredible design work for Generosity Day this year, and this morning we’re launching the www.spreadgenerosity.com site that they designed. You can get a sneak peak here but please click over and play around some. There’s lots to discover and all of it is designed to help you share your generosity story and spread the word. Just three days to go. Can you hear the distant rumble? That’s the momentum building. I write this post looking out at 21 inches of newly-fallen snow outside my house, slowly recovering from a bout of the flu (I believe) that has more or less floored me for the last 72 hours. There’s amazing momentum building, and the team just needs a few more volunteers. Here’s what you can do to help. Visit and like the Generosity Day Facebook Page and start spreading the word online using the #generosityday hashtag. Nothing inspires others more than hearing beautiful acts of generosity you have witnessed, or your experiences of generosity and why it matters to you. Send a note to your church group, your school, your online community or your colleagues sharing ideas of what you can do together on February 14th. Local media is interested in stories about and from people in their area, we’re looking to sign up local media ambassadors in cities across the country. You don’t need any media experience (in fact this is a great way to get some!). Emily, Chase and the team have prepared materials and training and the team will provide all the support you need. You just need to have 4-6 hours free between now and February 14th. Email Chase Ault and she will send you all the details. The team has already contacted hundreds of bloggers who have written posts about Generosity Day in the past. We hope you’ll all blog again this year – and if you’re not a blogger but you love someone’s blog, you could comment/email that blogger and suggest she write a post about Generosity Day this year. For those who are blogging, we can’t wait to hear your experiences of generosity, your own action, generosity that you have witnessed and that has touched you. Your readers will feel inspired and braver for hearing your story. Additional background contact and links for you are here. Thank you again for being part of this – for everyone from the volunteers to my readers to the people far and wide who have made Generosity Day their own, I’m humbled and am learning from each of you about what is possible. One thing I’ve noticed about generous action is that it can be hard to talk about. More specifically, doing something generous and then telling folks about it doesn’t necessarily feel natural. The interesting part is to watch what happens when you spread a story about someone being generous to you. Our critical brains are so adept at explaining why a small gesture of generosity – money, time, a smile or an open ear – is small, limited, maybe inconsequential. Yet our own experience of generosity holds the real wisdom. When we experience generosity, we feel noticed; we understand that we are not so separate from everyone else; we suspect that people around us are there to support us; we don’t feel alone. When you hear about someone experiencing generosity, it’s almost impossible not to recall and share that day when someone made you feel special, noticed, worthwhile and lucky. Don’t forget, we’re still on the hunt for a handful of additional Generosity Day volunteers. Spread the love. One of the highlights of this time of year for me is that people start reaching out to me more regularly to talk about their plans for Generosity Day – which is coming up on February 14th. I love the stories I get to hear about what they’ve done in past years, or what they just did or saw last week that inspired and grew their practice of generosity. I learn from and am humbled by each of these people. I’ve known since the start that Generosity Day is held by all of us – my role and the role of my co-conspirators has just been as catalysts. That said, one of the things I’ve learned is that big ideas, new ideas, great ideas, they need some nudges, pushes, and a bit organization around them. This is the fuel that allows them to catch fire. “I love generosity Day. When I heard about it last year, I told everyone I knew. I gave money to homeless people, tipped wildly, bought food to share for an organisation I was volunteering with, leant my cell phone to a stranger – and made a commitment that later became an initiative called ShareThanksgivingDinner.org. Needless to say, Parker’s note hit a perfect note for me, and I am thrilled that he’s offered to lead the organizing effort for Generosity Day 2013, and to help make the day an even bigger success. Right now, Parker is looking for a mini flash-mob of volunteers to make a big push over the next two weeks, and he’s created the Spreading Generosity Day website to help organize it all and make 2013 the biggest, best year yet. If you’re interested in volunteering in ANY way big or small for Generosity Day 2013 (everything from writing a few Facebook updates to pitching an article in your local paper to organizing a massive Generosity Day Meetup), please sign up now! Every time Generosity Day comes full circle, I know I’m the lucky one. So many actions, great and small, will go unregistered by all but those who take part in them, but every so often we get a glimpse of what the greater whole looks like and the power of a simple idea that spreads. It grows, it evolves, it strengthens in the hands of others. Recently, two teachers from Teach for India decided to bring Generosity Day into their classroom. To see these kids talk about what generosity means to them is a lesson for all of us, and a real gift. (if the video doesn’t appear below you can click here). We joined the Teach for India movement because of our belief that education is the answer to a lot of the problems that plague our nation and the world at large…. [and] we soon realized academic achievement alone will not be enough to change the life trajectory of our kids, that along with academic excellence they need grit. The strength to overcome difficulties and challenges at every step, but also zest and optimism to face everything that life throws their way with a smile. They will need gratitude to be thankful for what they have and empathy towards others. The affirmation of this [generosity] experiment came in the form of a generous act by one of Prateek’s students Pooja Patel. She spoke to him before school one day and asked if she could sit with Tusshar Gupta, one of her classmates who was struggling to meet his end of year goals. She said, “Bhiyya (elder brother), if I can get good marks, he can also do it, please give me a chance to help him.” From that day onwards for two months she relentlessly taught him before and after school hours and even went the extra mile by tutoring him at his house on weekends. The result was unbelievable. She showed the class that it was our collective responsibility to ensure everyone is on equal footing. My thanks and gratitude to Prateek and Sapna from Teach for India and to Keya Madhvani at Acumen for showing us all this light. How Many Ways Can We Be Generous in a Single Day? Note: this post first appeared on the Huffington Post. A lot of you know the background, but many have asked how this year’s Generosity Day compared to 2011, so I wanted to share that. Thank you for making it happen! That was the question we posed to the world as part of an effort to re-boot Valentine’s Day as Generosity Day. The premise was simple: Could we transform a day that’s been weighted down by overpriced flowers and boxes of candy into one known for active, purposeful generosity to all? 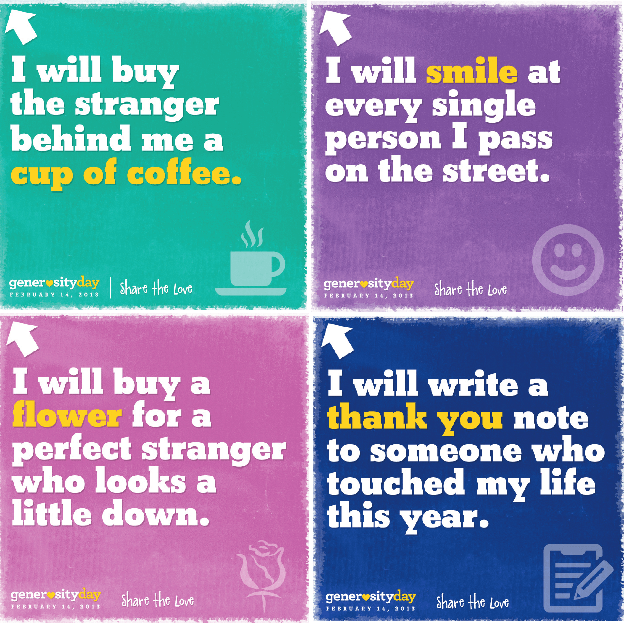 The idea for Generosity Day was hatched last year, after I conversation I had with Katya Andresen at Network for Good about my “Generosity Experiment” — a month in which I said “yes” to absolutely ever request for help. The idea was simple enough, but changing my standard response from “no” to “yes” wasn’t. Each time I gave to a homeless man or a musician on the street, each time I got a coffee or ate out and I tipped outrageously, each opportunity to help a colleague or greet someone I’d passed every day but didn’t know — these were all opportunities to reassess how I walk through the world, to reevaluate what had become normal behavior of being too rushed, too closed off, too much in my own head to fully see everyone around me. It was transformative and I wanted others to have that same experience, even if just for a day. Generosity Day 2011 was born out of this very simple idea: Could we get the world to say “yes” for a day? Amazingly, with less than 72 hours of lead time and no budget, we did, so we knew we were on to something and decided to do it again in 2012 to make it even bigger and better. The day surpassed all expectations, as people all over the world participated and shared their stories. The word spread on social media, where we counted more than 5,000 tweets seen by millions of people, hundreds of articles and blog posts (too many to count), three amazing organizations made videos on their own dime that were seen more than 40,000 times in one day (here, here and here), and Kevin Bacon even tweeted and took an awesome photo to help spread the word. None of this would have been possible without the spontaneous partnership of organizations like Network for Good, Global Giving, the Case Foundation, Kiva, the Gates Foundation, See3 Communications, the Jubilee Project and amazing bloggers like Beth Kanter, Brene Brown, Kelly Wallace, and, of course, Katya Andresen. More exciting still, thanks to our friends at Causes we were able to create the Generosity Day Causes site, both so people could learn about Generosity Day and so they could share their own generosity stories. One person shared that she approached an elderly woman on the street and gave her a rose, only to be told that this the first Valentine’s Day flower she’d ever received. Another woman finally had coffee with someone she’d long thought could a new friend — and she was right. A third person told an 80-year-old woman how beautiful she was and the woman shed a tear, saying that no one had told that to her that in years. Much more than any statistics about the word spreading far and wide, it is these actions that made Generosity Day real, these actions that created innumerable moments of joy. We heard stories of anonymous acts of kindness, outrageous over-tipping and heartfelt thank you notes. We heard about people paying strangers’ tolls on the parkway, folks passing out croissants to the morning-rush crowd, and loads of people who spent the day or the night volunteering. We heard from people who were donating money, and those who were donating blood. We heard from so many people who made the day better for others and experienced the joy of generosity themselves. These are the actions that rippled through people’s lives, these are the ways that people created new expectations and a renewed sense of possibility — about how they can act, how others might act towards them, and what, collectively, could happen if we all were more purposefully generous each day. 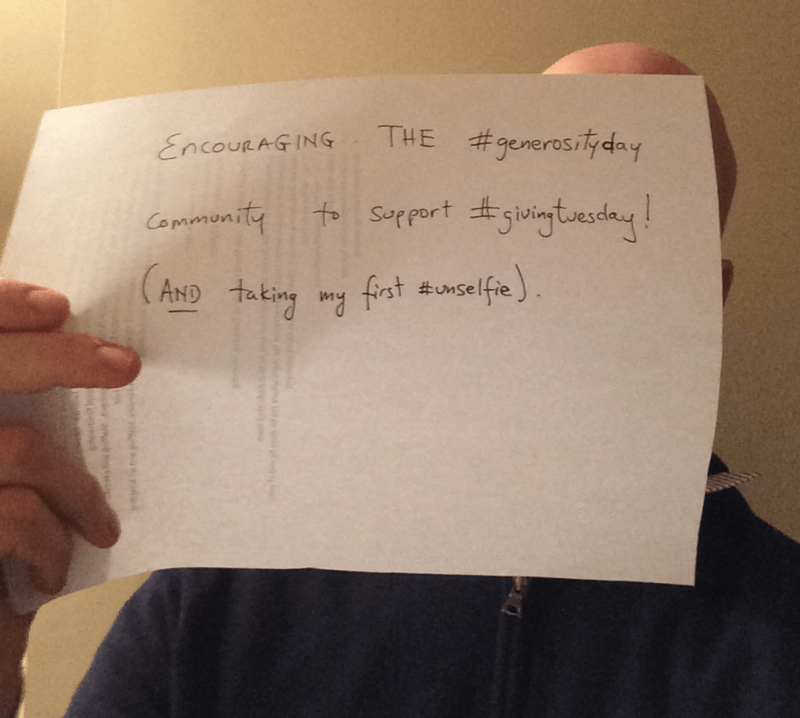 The good folks at Say100 Media asked me to answer some questions about Generosity Day. Here’s the text or the original interview is here. We asked Sasha to tell us about Generosity Day 2012, why generosity is contagious, and how to move millions of people to action without spending a dime. 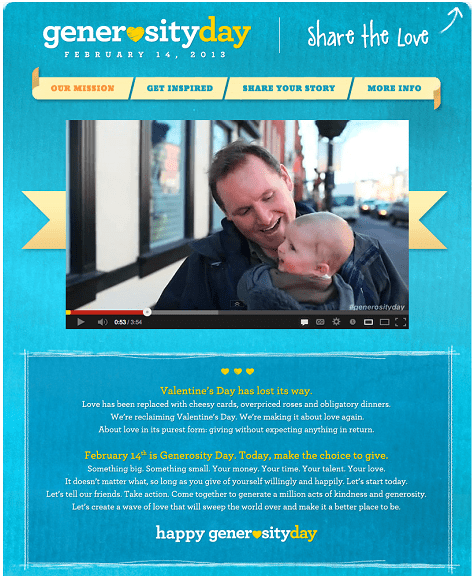 What are the key things marketers can learn from Generosity Day? In 2011, Generosity Day went from an idea to a global phenomenon in 72 hours – with no resources behind it. This would have been impossible if the idea hadn’t been simple, sticky, compelling, a message that was easy for people to own that they were eager to spread. As marketers we understand these lessons, but we still put way too much effort into figuring out clever ways to try to spread OK ideas instead of putting all our effort into creating great ideas. Generosity Day was an idea that was built to spread and it reminded me how often we’re pushing the rope on an idea that matters to us but doesn’t matter to our audience. What are some of your favorite ways to be generous that don’t involve giving money? Giving money actually is the easiest form of generosity. Generosity of spirit – being consistently kind to others, open, giving someone the benefit of the doubt, assuming the best in someone else – that’s where the rubber really hits the road for me and where the real work is. It’s so easy and such a bad habit to be quick to judge, and when that happens we are blind to so much wisdom, grace, creativity, knowledge and love. Quick judgment is the easy way to surround ourselves with people who act like us, think like us, make us feel safe … so generosity of spirit is a way to open the door to a whole new set of people and experiences. Has the economic uncertainty in the financial world made people more or less generous? The official numbers say that giving levels have remained the same throughout the recession, so it’s hard to judge. In my experience people are definitely feeling more uncertain so while they may still be giving, willingness to make larger and longer-term commitments seems to be decreasing. Is generosity contagious? If yes, why? Absolutely. We know that when someone discovers a few extra quarters in a vending machine they are much more likely to be generous to the next person – to pick up papers that someone has dropped or to help them solve a problem. This is hard-wired into our brains, so one generous act begets another. We’ve all experienced this personally, but we rarely think about the massive multiplier effect if we could create even a moderate shift in generosity at a societal level. Part of the problem is that we lack the lexicon and the habit of thinking more broadly and systemically about the role that generosity plays in our lives. Historical traditions, whether religious or tribal, have this vocabulary embedded in ritual and scripture – we once understood that people need guideposts and clear expectations about how to treat one another. It’s time to revive this language and make it applicable to our modern lives. Do you still say find yourself saying yes to everything? No. I did an experiment of saying yes to requests for help for a month so I could see what shifting my default response would do for my orientation to life. It was a powerful experience but I can’t literally do it every day. If anything I’m working on saying no to more small things and yes to the big scary ones. Even if I can’t say yes to everything, I can change my orientation, I can recognize that I want to be more opens – to people, new ideas, improbable connections, possibility. The generosity experiment was a tangible way to practice that. How did Generosity Day go this year? Any favorite stories? It was incredible. 2011 was our first year and we had no lead time at all – we conceived of the idea on Friday and had three days to spread the word. This year it was at least twice the size and people all over the world participated and shared their stories. We had more than 5,000 tweets seen by millions of people, hundreds of articles and blog posts (too many to count), three amazing organizations made videos on their own dime that were seen more than 40,000 times in one day (here, here and here). Kevin Bacon even tweeted and took an awesome photo to help spread the word, and best of all we got to capture some amazing generosity stories on the Generosity Day Causes site. And not a single dollar was spent to spread the word – everybody donated everything. I was really touched by so many stories: someone shared that they’d told an 80 year old woman how beautiful she was and she shed a tear and said that no one had told that to her that in years; another guy bought $50 worth of Starbucks gift cards and shared his honest challenges in giving them away; a group in London spent the morning talking about generosity and all committed to specific generous actions – including walking around London giving out croissants to people on the street and talking about Generosity Day! It’s all fun and positive and it cracks the door open to new kinds of conversations and reflections. If everyone were a little more generous would all our problems be solved? Sadly, no. Solving big problems is hard work, and generosity alone isn’t enough. But I’m sure that everything would be better, that more trust would be built, that more connections would be made, that we would see more possibilities if we all were more generous. What are your top three priorities right now? We just had our 10 year anniversary at Acumen Fund where I’m the Chief Innovation Officer, so that was an opportunity for real reflection and also looking to the future. With more than $75 million invested in sustainable businesses that have served more than 85 million low-income customers, we have a lot to be proud of but also a lot of work left to do! So my top priorities are around scaling our impact: getting a much deeper understanding of the social impact we’re having on the lives of the poor and sharing those models with the world; helping people who are interested in our space (which has been termed “impact investing”) to understand that we have to be laser-focused on creating large-scale social change, and that if you make unattractive financial returns that create massive social dividends that is OK; and the global expansion our Fellows programs so we can deepen the bench of leaders who can do this work globally. You’ve tried some other experiments recently like giving up meat, and the 360 project. What experiments are next? None of these are planned, so I honestly don’t know. They all come from a recognition that there’s nothing special or necessarily right about the way I’ve always done things, and a lot of old habits, attitudes and approaches aren’t serving me well. The leaders I admire the most seem to have an almost unending capability to evolve, to learn, and to grow, so I’ve made a firm commitment to being willing to change and am enjoying seeing where that takes me. Learning how to change is probably my greatest accomplishment over the last 5 years.